ST. LOUIS, Mo. (Jan. 4, 2019) – Indiana University senior defender Andrew Gutman (Hinsdale, Ill.) and Stanford University sophomore forward Catarina Macario (San Diego, Calif.) were presented the 2018 MAC Hermann Trophy on Friday at the Missouri Athletic Club’s annual banquet. The MAC Hermann Trophy, a 10-pound crystal soccer ball awarded annually since 1967, honors the United Soccer Coaches National Players of the Year in NCAA Division I men’s and women’s soccer based on voting conducted by NCAA Division I coaches. Gutman contributed career-highs with 11 goals and nine assists for 31 points in 2018, leading the Hoosiers in goals and points. The unanimous Big Ten Defensive Player of the Year anchored an IU defense that allowed just 13 goals over 24 games en route to a College Cup semifinal appearance. He capped his four-year career with 20 goals and 17 assists. Runners-up for the men’s award were University of Denver senior forward Andre Shinyashiki (Sao Paulo, Brazil) and University of Kentucky junior forward JJ Williams (Montgomery, Ala.). Macario tallied a team-high 14 goals and 36 points in 2018 to help the Cardinal back to the College Cup semifinals. The Pac 12 Forward of the Year led the conference in game-winning goals and finished tied for ninth in the country in total points. She is a two-time First Team All-American and Pac 12 Forward of the Year in her first two collegiate seasons. Runners-up for the women’s award were Stanford senior midfielder Jordan DiBiasi (Highlands Ranch, Colo.) and Georgetown University senior forward Caitlin Farrell (Wallingford, Conn.). Established in 1903, the Missouri Athletic is a private social, business, athletic, and dining club with locations in Downtown St. Louis and Town and Country in West St. Louis County. The MAC is a Platinum Club of America, an honor bestowed on the top 3% of private clubs in the United States. KANSAS CITY, Mo. (Dec. 7, 2018) – United Soccer Coaches announced on Friday the men’s and women’s finalists for the 2018 Missouri Athletic Club Hermann Trophy, presented by World Wide Technology, based on voting by NCAA Division I soccer coaches. The three men’s finalists are Indiana senior defender Andrew Gutman (Hindsale, Ill.), University of Denver senior forward Andre Shinyashiki (Sao Paulo, Brazil) and Kentucky junior forward JJ Williams (Montgomery, Ala.). Gutman leads Indiana into tonight's College Cup semifinals, while Shinyashiki led the nation in goals scored this year and Williams was third. The three women’s finalists are Stanford senior midfielder Jordan DiBiasi (Highlands Ranch, Colo.), Georgetown senior forward Caitlin Farrell (Wallingford, Conn.) and Stanford sophomore forward Catarina Macario (San Diego, Calif.). DiBiasi was the Pac-12 Midfielder of the Year, while Farrell was third in the nation in goals scored and fourth in points and Macario is a two-time First Team All-American. The MAC Hermann Trophy, the most coveted individual honor in NCAA Division I soccer, has been awarded annually since 1967. This year’s winners will be announced on Jan. 4, 2019 in conjunction with the 2018 MAC Hermann Trophy Banquet at the historic Missouri Athletic Club in St. Louis. KANSAS CITY, Mo. (Aug. 9, 2018) – United Soccer Coaches and the Missouri Athletic Club announced today the 75 NCAA Division I players named to the 2018 MAC Hermann Trophy Watch Lists, presented by World Wide Technology. Air Force senior Tucker Bone and Florida International senior Santiago Patino were MAC Hermann Trophy semifinalists a year ago and they lead a group of 31 players on the Men's Watch List for the upcoming 2018 season. Ten of the 31 players were United Soccer Coaches All-Americans in 2017. A total of 44 players are included on the Women's Watch List, headlined by 2017 finalist Jessie Fleming of UCLA and five semifinalists; Stanford junior Tierna Davidson, South Carolina junior Grace Fisk, Stanford sophomore Catarina Macario, UCLA senior Hailie Mace and Rutgers senior Casey Murphy. Seventeen of the 44 players were United Soccer Coaches All-Americans last season. The MAC Hermann Trophy Watch Lists are compiled by members of the United Soccer Coaches Men’s and Women’s NCAA Division I All-America Committees. 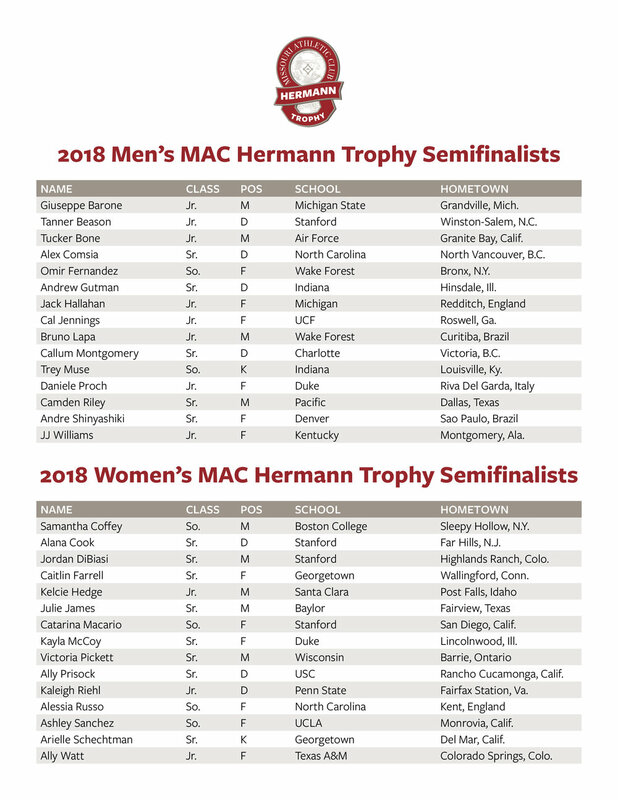 Fifteen semifinalists will be named for both the men’s and women’s MAC Hermann Trophy near the end of the college season based on voting by NCAA Division I coaches and from those candidates, three finalists will ultimately be placed on the ballot for the coveted award. Click here to view the 2018 Watch List. ST. LOUIS, Mo. (January 5, 2018) – Wake Forest University senior forward Jon Bakero (Sitges, Spain) and Stanford University senior midfielder Andi Sullivan (Lorton, Va.) were presented with the 2017 MAC Hermann Trophy on Friday at the Missouri Athletic Club’s annual banquet. Bakero contributed 16 goals and 14 assists in 2017 as a team captain to lead the nation in scoring with 46 points, second most in Demon Deacons history and most by a Wake Forest player since 1983. The ACC Offensive Player of the Year caps a four-year collegiate career with 37 goals and 26 assists, and becomes the second straight player from Wake Forest to receive the MAC Hermann Trophy after Ian Harkes earned the award a year ago. Runners-up for the men’s award were Stanford University senior defender Tomas Hilliard-Arce (Matthews, N.C.) and Indiana University senior defender Grant Lillard (Hindale, Ill.). Sullivan tallied three goals and six assists in 2017 to captain Stanford to their second national championship, scoring in the NCAA Women’s College Cup final. The Pac-12 Midfielder of the Year and a three-time All-America First Team selection, Sullivan claims the MAC Hermann Trophy after recovering from a torn ACL in 2016. Sullivan, who has made seven appearances for the United States Women’s National Team, caps her college career with 20 goals and 18 assists. Runners-up for the women’s award were UCLA sophomore midfielder Jessie Fleming (London, Ontario) and University of South Carolina senior forward Savannah McCaskill (Chapin, S.C.). Bakero will next attend the 2018 MLS adidas Player Combine from Jan. 11-17 at Orlando City Stadium in Florida, while Sullivan will join the U.S. Women’s National Team for a training camp from Jan. 6-21 at the U.S. Soccer National Training Center in California. (December 8, 2017) – United Soccer Coaches announced on Friday the men’s and women’s finalists for the 2017 MAC Hermann Trophy, based on voting by NCAA Division I soccer coaches. The three men’s finalists are Wake Forest University senior forward Jon Bakero (Stiges, Spain), Stanford University senior defender Tomas Hilliard-Arce (Matthews, N.C.) and Indiana University senior defender Grant Lillard (Hinsdale, Ill.). Hilliard-Arce and Lillard led their teams to tonight’s College Cup semifinals, while Bakero’s 16 goals and 14 assists each rank second in NCAA Division I men’s soccer this season. The three women’s finalists are UCLA sophomore midfielder Jessie Fleming (London, Ont. ), University of South Carolina senior forward Savannah McCaskill (Chapin, S.C.) and Stanford University senior midfielder Andi Sullivan (Lorton, Va.). Fleming and Sullivan each scored in this year’s NCAA Division I women’s soccer national championship, while McCaskill is a three-time All-American and current finalist for U.S. Soccer’s Young Female Player of the Year. The MAC Hermann Trophy, the most coveted individual honor in NCAA Division I soccer, has been awarded annually since 1967. This year’s winners will be announced on January 5, 2018 in conjunction with the 2017 MAC Hermann Trophy Banquet at the historic Missouri Athletic Club in St. Louis. (November 28, 2017) – United Soccer Coaches announced on Tuesday the 15 men’s semifinalists and 15 women’s semifinalists in consideration for the 2017 MAC Hermann Trophy, based on voting by NCAA Division I soccer coaches. The MAC Hermann Trophy, the most coveted individual honor in NCAA Division I soccer, has been awarded annually since 1967. Most recently, Ian Harkes (Wake Forest) and Kadeisha Buchanan (West Virginia) received the award for outstanding intercollegiate performances during their senior seasons in 2016. Three men’s finalists and three women’s finalists will be named on December 8 in conjunction with the Men’s College Cup semifinals in Philadelphia. The 2017 MAC Hermann Trophy banquet will be held at the Missouri Athletic Club in St. Louis on January 5, 2018 to formally announce this year’s winners. For more information about the history of the MAC Hermann Trophy, visit MACHermannTrophy.org. Brandon Bye Sr. F Western Michigan Portage, Mich.
Cameron Lindley So. M North Carolina Carmel, Ind. Santiago Patino Jr. F FIU Orlando, Fla.
Tierna Davidson So. D Stanford Menlo Park, Calif.
Imani Dorsey Sr. F Duke Elkridge, Md. Indigo Gibson Sr. D California Las Flores, Calif.
Vanessa Gregoire Sr. M Princeton Beaconsville, Que. Catarina Macario Fr. F Stanford San Diego, Calif.
Hallie Mace Jr. F UCLA Ventura, Calif.
Rebecca Quinn Sr. M Duke Toronto, Ont. Brianna Visalli Sr. M Pepperdine San Jose, Calif.
(August 8, 2017) – United Soccer Coaches and the Missouri Athletic Club announced today the 61 NCAA Division I players named to the 2017 MAC Hermann Trophy Watch Lists. Florida Gulf Coast University senior Albert Ruiz and University of Maryland junior Gordon Wild were MAC Hermann Trophy finalists a year ago and they lead a group of 31 players on the Men’s Watch List for the upcoming 2017 season. Fourteen of the 31 players were United Soccer Coaches All-Americans in 2016, including senior teammates Tomas Hilliard-Arce and Foster Langsdorf from back-to-back national champions Stanford University. A total of 30 players are included on the Women’s Watch List, headlined by 2016 finalist Andi Sullivan and four previous national champions: Florida State goalkeeper Cassie Miller, University of Southern California defender Ally Prisock and Penn State teammates Emily Ogle and Frannie Crouse. Thirteen of the 30 players were United Soccer Coaches All-Americans last season, including UCLA sophomore Jessie Fleming who featured for Canada in the 2015 FIFA Women’s World Cup and the 2016 Summer Olympics. View the 2017 Watch Lists. The three men’s finalists are Wake Forest University senior midfielder Ian Harkes (Fairfax, Va.), Florida Gulf Coast University junior forward Albert Ruiz (Barcelona, Spain) and University of Maryland sophomore forward Gordon Wild (Cologne, Germany). Harkes helped lead the Demon Deacons to the College Cup final, while Ruiz and Wild were the top two goal scorers in NCAA Division I men’s soccer this season. The three women’s finalists are University of Southern California senior midfielder Morgan Andrews (Milford, N.H.), West Virginia University senior defender Kadeisha Buchanan (Brampton, Ontario) and Stanford University junior midfielder Andi Sullivan (Lorton, Va.). Andrews, a two-time NSCAA All-American, and Buchanan, a four-time NSCAA All-American, met in the College Cup final. Sullivan was an NSCAA First Team All-American for the second straight year. The finalists for the 2015 men’s MAC Hermann Trophy are Brandon Allen (Georgetown), Fabian Herbers (Creighton) and Jordan Morris (Stanford). The finalists for the women’s award are Kadeisha Buchanan (West Virginia), Raquel Rodriguez (Penn State) and Emily Sonnett (Virginia). A live stream of the press conference announcing the winners will be carried on machermanntrophy.org beginning at 6 p.m. (CST).